The medical sector is proving to be a growth sector. Valves are saving lives – at the same time, manufacturers have to satisfy growing expectations. Just 60 years ago babies born prematurely died of lack of oxygen if their lungs weren’t fully developed. Today, modern lung ventilators ensure such children are able to survive. Valves are to be thanked, and help heal. Requirements, however, continue to rise for manufacturers. Only the best high-tech products have a chance in the market for medical technology. It certainly makes itself paid for valve manufacturers and other technology suppliers to be successful in the medical technology market. Despite great challenges. According to the newest report from GTAI, the US Commercial Service, and Eurostat/Spectaris, worldwide production of medical technology in 2015 totalled 310 billion US Dollars. The USA accounted for nearly 38.8 percent of the market, followed by China with a share of 12.2 percent, and Germany with a slice of 9.3 percent. The medical technology sector is seen as a highly innovative and propitious growth market, emphasises the German Medical Technology Association BVMed. Medical technology comprises a broad scope of products and processes that save lives, help heal, and improve people’s quality of live, declares the BVMed. Germany’s Ministry of Health estimates there are around 400,000 different medical technology products. Examples range from devices for diagnostics, surgery, intensive care, implants, sterilisation to bandages, adjuvants or surgery materials. “According to the German medical products law (MPG), lab diagnostics are also viewed as medical technology equipment,” adds the BVMed. Valves are a common component of life-saving and therapeutic devices. They are of decisive importance in surgical equipment, dental stations or ventilators. Essential components, “for which costs and effort to meet relevant regulations and entry requirements are, however, constantly rising for product development and production,” emphasises Michael Mack, global product manager Piezo, HOERBIGER Compression Technology. Reasons are stricter and changing regulations. Furthermore, national and international regulatory requirements need to be observed, as a consequence of globalisation. There is no standstill in medical technology: changes in regulations and the development of new, innovative methods in areas such as diagnostics and therapy mean new products and product modifications, underscores Michael Mack, global product manager Piezo, HOERBIGER. Needless to say, investments are a matter of course for HOERBIGER. Higher requirements apply for devices or systems covered by Germany’s medical product law (MPG). “Here, the intended purpose of a valve in an application and inside of a medical technology device plays an important role,” explains Peter Jaschke, head of business development MedLab, Festo. Materials compatibility needs to meet requirements – this concerns wetted components, as well as parts directly in contact with the human body. „Traceability and change management are topics that in parts need to be considered for risk-relevant components”. However, there also are entirely non-critical areas in medical technology where standard industrial products and components can be used, adds Jaschke. This forms a further reason why requirements keep growing for valve manufacturers. “Requirements for producers and distributors for quality management (QM) and QM systems stemming from the international norm ISO 13485 are increasingly being passed on down to suppliers, such as valve manufacturers. As a consequence, the additional personal and financial expenditure required is considerable“, explains Jaschke. Festo was early to notice this and had its research and development and production certified for ISO 13485. Expectations for components in medical technology also are high, reports Michael Mack, HOERBIGER. “Energy efficiency and weight reduction play a central role for battery-operated and mobile devices – while, at the same time, reliability, operational dependability, a long product lifecycle and product availability over a long period without technical changes are demanded. Requirements are especially high for respirators for prematurely born babies, where, in extreme cases, respiration is entirely taken over by the machine. In order to be up to par, HOERBIGER offers a pressure regulating valve from its piezo valve product portfolio. “Our piezo technology can fully demonstrate its strengths: extremely fast rise time during continuous pressure changes between in- and exhaling allow an ideally natural function of a non-independently functioning lung. Exhaling, in turn, requires a high flow rate. At the same time, a permanent basic pressure has to be set, which is adjusted very finely and may only have a minimal variation. Owing to the extremely low power input it is furthermore possible to increase battery life in mobile or emergency operation mode and thereby raise operational safety to a level conventional valve technology can only realise with additional effort,” reports Michael Mack. And as these performance-defining components, of which even three are installed in each device, virtually don’t generate any heat, a much smaller ventilator can be used. “Combined with the valve’s noiseless switching and regulation, the operating noise of the device is enormously reduced, which in turn positively affects the baby’s recovery”. Eye surgery is a further field of use for piezo valve technology. Here, it optimises delicate processes. Different fluids and gases have to be conveyed during eye surgery. Festo developed proportional valves and piezo valves, as well as integrated sensors. These allow “the precise delivery of vitreous humour replacement solution, help with the vacuum-assisted removal of microparticles and drive all kinds of surgical tools”. A further application for the piezo valve is in the treatment of chronic obstructive pulmonary disease (COPD), affecting around 600 million people around the world, who suffer from breathing problems. Aportable oxygen system device improve the mental and physical ability of patients, and their quality of life, reports Festo. Japanese company Musashi Medical Laboratory supplies easy-to-use controllers as small as a smartphone, making handling easier and improving comfort. Compact piezo valves made by Festo silently supply oxygen. The device used for COPD is matched to a patient’s respiratory rate. “A sensor ensures that the regulator detects inhalation. The right amount of oxygen is then mixed with the respiratory air,” explains Festo. During inhalation, the sensor detects a pressure drop and transmits a signal to the regulator which in turn opens the proportional valve. Oxygen then flows from the oxygen bottle – not uninterruptedly as with other devices, but only for as long as the patient is inhaling. As soon as inhalation has been completed, the piezo valve shuts off the supply of oxygen. “Oxygen consumption is thus much more efficient. The oxygen bottle doesn’t have to be refilled as often. 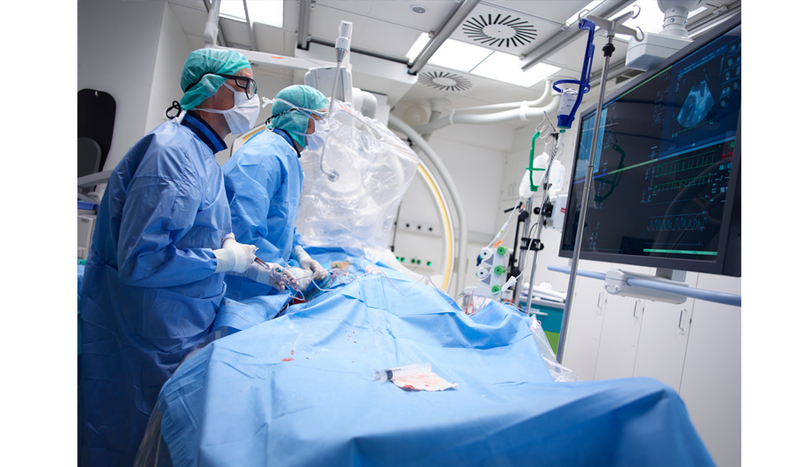 The patient’s range of action is increased as a result,” highlights the valve manufacturer. Even better: thanks to the energy efficient piezo valve, the device has a vastly improved battery life. Further applications are pneumatic integration solutions for surgical tools and regulating fluids in dental service units. Anaesthesia, intensive care and emergency medicine also require valves.